M2 money stock is comprised of business and consumer liquid cash accounts. Savings, checking, money market. They are the accounts, if you’re not spending with debt, you first tap to spend or invest. This indicator is commonly known as a ‘one-year-out’ recession warning when its growth level falls below 2%. Which it just did, after being over 6% as recently as 2016. The data appear incompatible with forecasts by the International Monetary Fund and other global bodies for a synchronized global upswing this year. 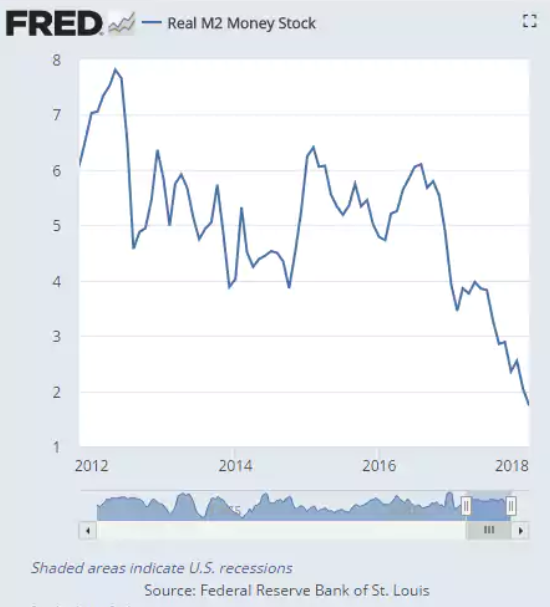 The growth rate of the "broad" M3 money supply in the United States -- covering a wide range of deposit accounts as well as cash -- has dropped to a six-year low and is flirting with "stall speed." Over the last three months the measure has slumped to an annual rate of 2 percent in the U.S. and 1.2 percent in Japan. Broad money is often a powerful predictor of economic activity a year or so later. Critics say the Fed is relying on a broken model and pays no attention to broad money data, preferring backward-looking indicators such as unemployment and wage growth. This ‘New Keynesian’ outlook led to a series of mistakes in 2008 when it ignored red alert warnings from the monetary aggregates and allowed the incipient financial crisis to metastasize.